EverQuest II - News - Pirates Are In Season. See Our June Marketplace Additions! Pirates Are In Season. See Our June Marketplace Additions! If you’re looking to pick up all of the themed furniture to go with this home, pay attention to special Rum Cellar Cove bundles in the Marketplace. 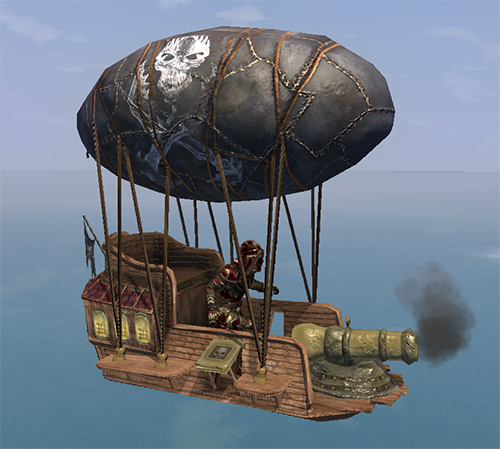 Set sail on this flying pirate zeppelin! The Onyx Raider is a variant version of an elusive Rum Cellar Campaign mount you may have already seen soaring across the skies of Norrath. Get yours today! Don’t forget to check back with us later because we’re always adding new and unique items to the EQ2 Marketplace. To buy any of these items using your Daybreak Cash, just click the DBC button in game or type /marketplace in your chat window. Need more Daybreak Cash? Visit the Daybreak Cash page for more information and learn how you can get Daybreak Cash online!